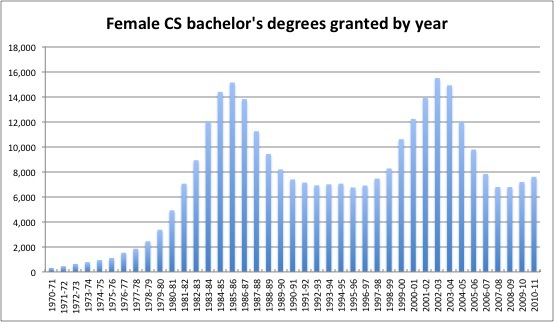 As shown by the following graph, the percentage of bachelor's degrees going to women in the US has increased over time in almost every major, with the dramatic exception of CS, which peaked in 1984 at 37%, then fell drastically, never to rise again above 20%. Why are the numbers for CS so different from every other field? This is relevant to CS education for those who want to make sure that students have equal opportunity regardless of gender. Since some readers seem to have misunderstood my question, let me be explicit that I am not asking why fewer women than men study CS, nor do I mean to imply that people should not be free to change their own majors. 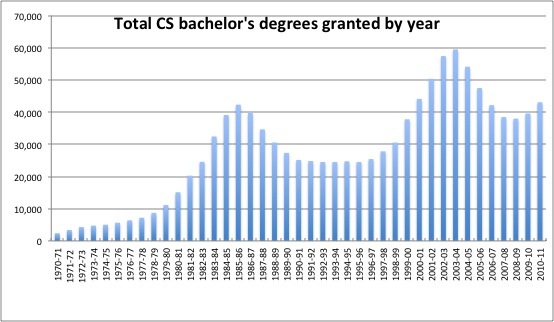 I am asking why the proportion of CS bachelor's degrees in the United States going to women fell dramatically after 1984. Obviously, there is no way to definitively know the answer to this question. But my favorite theory has to do with the advent of the home PC, and the original marketing of computer games to boys. The strongest support for this theory is the timing, which means that I must now give the obligatory caveat that correlation is not causation. Basically, the theory goes like this: as the home PC started to sell, the good folks in marketing had to choose which groups they would target with their limited ad dollars. The earliest games that came out involved balls and shooting anyway, so young boys were chosen as the target market. And thus began a generation of young boys who logged hundreds or thousands of hours with computers, with no corresponding boost for the girls. As this generation of children reached university age, more boys signed up for computing majors, and professors began to tailor their classes towards this majority of people who already had some background. Girls who did come in often felt like fish out of water (and abandoned the major), leaving us where we are today. It does not have to be so. There are inroads being made into this problem, and I am hopeful that with the total infusion of computers into all of our lives that is going on now, the timing is right for this problem to begin to fix itself, as the experience differential has begun to level out. outnumbering men by at least 3-to-1 in all of those fields. Each woman who spends all of her time studying to become a doctor is a woman who isn't studying to be a computer scientist. The clear common ground between those four fields is that they're highly social and focused on helping others. By contrast, men dominate the fields that are perceived to be the least social, i.e. Computer Science and Engineering. There's also some variation based on how math-heavy a field is; for example, women are relatively more likely to do Biology than Physics. But, that effect doesn't appear to dominate. For example, women are fairly well-represented in Math and Physics. Also, women may choose Biology more often because it's a popular major for students planning to go to med school. If you're an instructor in high school or college, then you have direct access to students around the time that they're making their study choices. So, asking them what they want to do and why seems like a good path toward personal understanding. You're probably going to hear stuff like "I want to help others" more from the women and "I like computers" more from the men. Ultimately, their major will be their choice, so it's all about understanding what they want. The first peak, around 1985, is before my time. However it's my impression that there was a major loss of momentum around those years. The term "AI winter" was coined in 1984, suggesting that pessimism was prevalent enough to assign it a name in discussion. Presumably this pessimism dissuaded incoming college students from selecting CS, causing the drop a few years later when they graduated. That second peak looks like it's centered around 2004/2005, suggesting that students were really optimistic about Computer Science around 2000/2001. And those years were the peak of the dot-com bubble, which started its clear burst in late-2000. It seems probable that the dot-com bubble bursting dissuaded incoming students from going into CS then, too. The peaks look more pronounced for women; presumably if we had a graph of just men, we'd see their enrollment had a milder response. 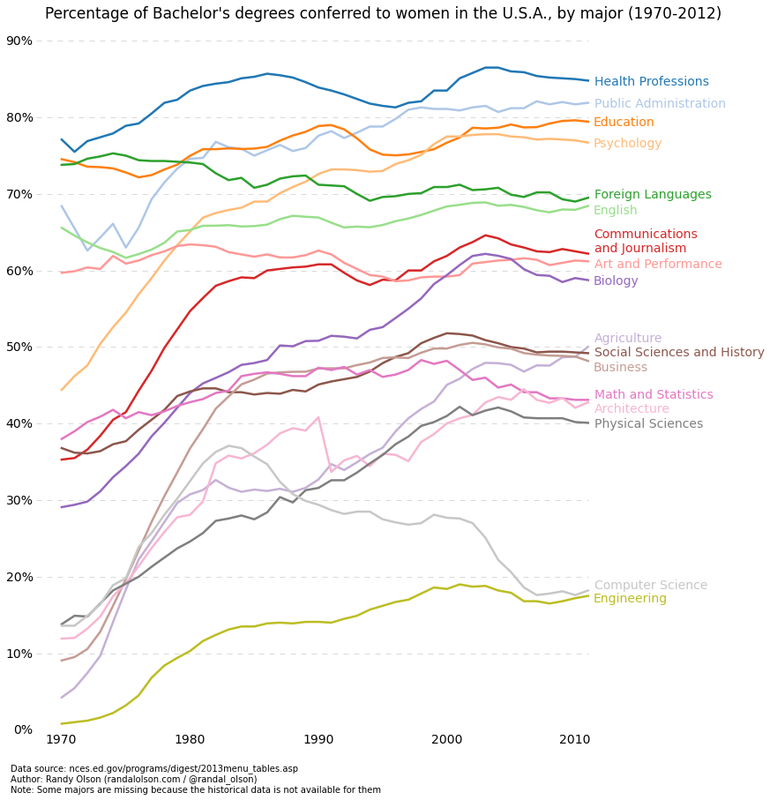 As shown, women chose CS relatively more often until the peaks, then relatively chose other majors after the peaks. So women like being medical professionals more than programmers - awesome! As long as people are freely choosing what they want to do, then that's exactly what we should be striving for. As Ben said, marketing targeted men. Advertisements featured boys on personal computers. That was how it started. IBM and Apple marketed the first personal computers in 1977. Apple launched the Apple II and advertised their new product. Their ads, as stated, featured men using the brand new computer3. IBM soon followed suite. Apple's product might well have contributed to the effect displayed by the graph in the question. This shows us how things started. From there, social media, and social trends took it to worse levels. Movies, books and other media showed men as computer geeks. A study of Carnegie Mellon's Computer Science degree path shows that half of the women in the program ended up quitting, and more than half of them were on the Dean's List. So, effectively, it was marketing which piled things up with advertisements featuring men exclusively. "Cultural" changes lit the pile up and it's been burning since. Later on, towards the 2000s, this trend continued (but the "fire" was burning lower than in 1985). Recent efforts have been successful, and with the rising awareness to the issue, it looks like a solvable one. So effectively, the reason for the difference is a process. One that marketing started, and the social narrative took to a higher level. But that can be changed, and a part of education is teaching students to help change this narrative. I find it amazing that nobody here even mentioned the possibility that men simply find programming much more interesting than women do. In the 80's personal computers became more common; boys liked them, girls didn't. There that's it, that's the whole explanation, the simplest and using Occam's razor the better one. Why did they quit? Because they didn't like it. As to the rest of his answer and the other answer I find the whole notion of advertisements creating reality ridiculous. Advertisers base their ads on reality, not the other way around. When I was a kid in the early 90's I went to an evening school. Part of the curriculum was programming and all the boys immediately liked it. It wasn't advertised in any way and there was certainly absolutely nothing done by the teachers that would imply that it is more for boys than for girls. Computing was historically a female-dominated field. "Computers" used to be mostly women working out mathematical calculations. With the advent of mechanical and then electrical computers (during WW2, when men were sparse already), these women were drafted to do the data entry and cross-checking. When input complexity evolved from entering numbers into a calculator to actual programming, it took a while for men to realize that it required actual thinking. There's a famous Grace Hopper quote about how women are naturals at programming because scheduling assembler instructions is just like dinner planning. Up to the 70s, most men wouldn't touch a keyboard because "typing is for their secretaries". Programming was something you did while you waited for marriage. While I have not seen any compelling evidence ether way. I as wondering if there is a true underlying gender element, or at least to deep to be fixed locally (with in CS). I wonder if this is related to “what are female roles?” and “What is a computer?”. For the first question, the answer is getting broader over time, so I don't think the answer lies here. For the 2nd this seems to change a lot. A calculator (Babbage) (where the name came from). As our view of what a computer is changes, it affects who wants to be involved. However a computer is all of these (and more), and it is non of there. It is a modelling machine. I suspect in the US it is a generational issue. A 22 year old woman graduating in 1984 would have been born in 1962 to parents who belonged to the Silent Generation. A 22 year old woman graduating in 1988 have parents who were Babyboomers. These two generations have vastly different values, and they raised their children with a different set of values. When I look at the graph, it seems like Engineering and CS follow a similar trajectory, with Engineering not reaching a peak as high as that of CS, but still peaking around 84, then showing a declining interest. Perhaps these fields were not viewed as "feminine" by those raised by baby boomer parents, and unintentionally imbuing young women and men with gender roles making young men more inclined to like CS. In contrast, silent generation would be less likely to view CS with a gender stereotype; instead they would view it as a good or bad career for their children, with less regard for whether CS was "feminine" enough for their little girls. As a child of Baby boomers myself, I certainly could spot the difference in children of parents born in the early 1950's and the children those born in the late 1930's. As the children of boomers - Gen X - become parents and their children are entering University, we might see this change. Somehow, though, it seems unlikely considering that many engineering and CS undergrads are international students anyways. As computer science degrees began to turn into software engineering careers the programs began to take on the culture and workstyle of engineering programs. Unfortunately this often means women face gender stereotypes and marginalizing behavior at the hands of their peers. I believe this is why efforts to improve enrollment for women in these programs continues to fail and women who graduate with engineering degrees will leave or never enter the field. The fall in CS degrees seems to match a rise in women getting degrees in business, psychology, science, and biology, which might be due to a higher proportional interest in those fields. Easier to use personal computers, which arrived in 1984 to '86 timeframe, and which could help solve problems in those other fields might have made those other fields more attractive. That would also be about the time the tail end of the post-war "baby boom" would be graduating. Perhaps the youngest siblings in that demographic, or later those from smaller families, have different personalities leading to different interests (in careers, etc.) than first borns and older siblings in larger families raised during that boom. There is one thing this graph is assuming and is certainly glossed over in the all of the answers is that a Computer Science degree has not meant the same thing at all over the years and may in fact have different meanings depending at what school that degree is earned. Example: I was enrolled at SDSM&T back in 1989 as a CS major. But, their idea of Computer Science stemmed from an Electrical Engineer perspective. Programming seemed to be only an afterthought and only in support of teaching physical AND/OR gates at it's most basic level. Fast forward a few years and a CS degree seems to imply programmer and not chip level engineer. I suspect that it mostly has to do with 2 peculiarities of the era. 1) Computer training programs which started ending in the early 80's (recession and layoffs). 2) Training in touch typing aka "business" classes in high school making computers "women's work"
Through the late 70's into the early 80's, there simply weren't enough people of any gender to fill all the new computer roles. So, companies like Westinghouse and Penelec (that I have first-hand knowledge of--but it applied to most companies of reasonable size) were basically paying for any warm body who wished to train on computers. If you were a man, these new "computer" jobs probably weren't much of a step up. Working at Bethlehem Steel probably paid better. However, for a bunch of women who had been relegated to secretarial or factory floor support roles which effectively had little career path, these computer jobs were very much an improvement. In addition, most computer jobs had a typing component, and practically all women coming out of high school went through at least one course which included typing. This is something that men of the era would also regard as "women's work". The recession clobbered a lot of businesses in 1981, so they killed all their training programs that were feeding women into computers. Of course, once the steel mills took a beating at the same time, these "computer" jobs didn't look so bad to the men anymore, either, so they started entering into the field from the bottom. So, roughly 4 years after 1980/1981 (the amount of time to complete a CS degree), you see women peak and then it starts to decline. Please do remember, though, that recessions were a bit more "phased" in the days before Internet time. Different sectors went down at different times. This is as opposed to now where a recession hits everything effectively simultaneously. This is less of an answer, since we don't have enough data to hypothesize. However, we do see that the total number of applicants decrease, and begin to rebound for men. The question may not be why it decreases for women, but why does it increase for men? Similarly, we have to evaluate the other opportunities women of the time would have had. Were there any significant changes in financial aid? Was there a disparity after 1984 or a trend incentivising women to go into other fields? Maybe shouldn't be so quick to assume that women were suddenly disinterested or disadvantaged. The real reason is more about the social issues: if you are a smart girl (or a smart boy) the rest see you as something bad (nerd, stuck up or other things), but it is worse for girls. What you see at home also makes a difference: my mother had a job and she said that I did not need to take crap from any man, so I am the biggest nerd in the planet (and proud of it). Very likely due to the influence of Grace Hopper. 1964: Hopper was awarded the Society of Women Engineers Achievement Award, the Society’s highest honor, “In recognition of her significant contributions to the burgeoning computer industry as an engineering manager and originator of automatic programming systems.”. 1969: Hopper was awarded the inaugural Data Processing Management Association Man of the Year award (now called the Distinguished Information Sciences Award). Likely young women reaching college age at about 1984 would have heard of her and been inspired by her example in years previous. After about then she was no longer making the news, so fewer signed up. This is only speculation of course! 1971: The annual Grace Murray Hopper Award for Outstanding Young Computer Professionals was established in 1971 by the Association for Computing Machinery. 1973: First American and the first woman of any nationality to be made a Distinguished Fellow of the British Computer Society. I observe that at the time of the decline in CS degrees there's an uptick in Business degrees. Was Information Systems introduced around that time? Not the answer you're looking for? Browse other questions tagged social-context equity or ask your own question. Where can I find a breakdown by race and gender of US CS bachelor's degrees?